Pier 3 - Hornblower Landing on the Embarcadero at Washington St. The spirits of some of San Francisco’s long lost speakeasies have risen from the crypt, and have taken asylum aboard The San Francisco Belle. On Oct 26th, we’re hosting a monsters shindig at sea aboard one of the finest vessels to sail in San Francisco. Brace yourselves for a night excitements, giggly refreshments, dancing, and a true sight for sore eyes, San Francisco’s glorious skyline. Now hurry along and order your tickets already because we’re putting on The Ritz aboard The San Francisco Belle. Fret not, this isn’t your ordinary haunting on a yacht. This is a Halloween San Francisco shindig for the ages. With the best in contemporary music curated by our onboard Disc Jockey, and one-of-a-kind looks at landmarks like The Golden Gate Bridge, Alcatraz, and Treasure Island, not to mention that gorgeous SF skyline. It may behoove you to arrive at the pier fitted in your finest prohibition-inspired garbs. Think flapper girls, oversized mobster suits, gloves, the works. If you fancy yourself a patron of the masquerade motif, than adding a lovely mask to your attire would be absolutely bully! These are only recommendations of course, as there is no mandate, nor dress code for the event. One more thing. 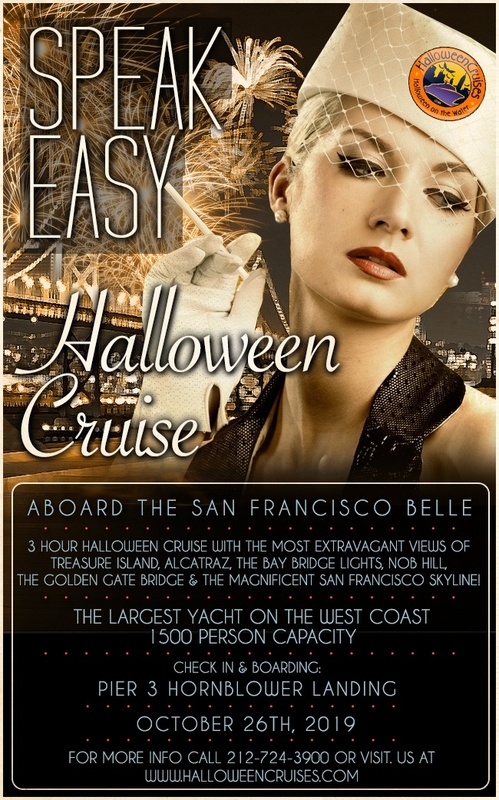 We’re only letting 1500 guests aboard this exclusive Halloween San Francisco event. So rest assured, no styles will be cramped aboard this vessel. The night will be an immense celebration, so capture as many moments as you can on that phone of yours. But don’t be stingy with all those memories, share some of those amazing pics and vids with us on Instagram, Twitter, and Facebook. Don’t forget to tag us; and while you’re at it, use our hashtag #HalloweenOnAYacht so everyone knows where the best Halloween San Francisco party was at! Golden Ticket - Step aboard and party like it’s 1929. Access to all four decks of The San Francisco Belle. Dance away to the musical stylings of multiple live DJ’s. Golden Couples - Cut a rug with your favorite fella; enjoy a night out with your glamorous gal. Access for two to all four decks of The San Francisco Belle. Golden Entourage of Four - Gather the gang and head to this sockdolager at sea! Access for four to all four decks of The San Francisco Belle. We’ve told you everything you need to know about the best Halloween San Francisco event of the season. Now all that’s left is to tell your friends, get an awesome costume together (or don’t), and order those tickets. Hurry! Tickets will move fast, so reserve your spot aboard today!